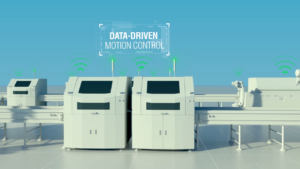 Elmo Motion Control, a leading provider of advanced motion solutions designed to make smart machines smarter for more than 30 years, oﬀers intelligent, ultra-small, rugged servo drives and motion controllers. Elmo provides motion solutions for some of the most demanding applications in the world. Elmo’s ultra-small drives and multi-axis controllers enhance overall accuracy, speed, and ensure fast, real-time responses of any application, improve throughput, and is known to give a competitive edge. Elmo Motion Control’s high-density servo drive, the Gold Twitter, has won the Technical Innovation of the Year at the 2018 Motion Control Industry Awards. 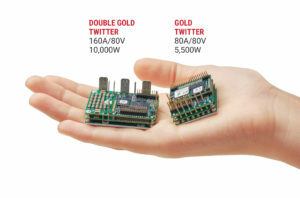 Ideal for high performance in limited space, the Gold Twitter drive weighs less than 0.7oz and measures the size of a postage stamp, yet can deliver over 5,500W of continuous qualitative power. Now the new version provides 10,000W! Elmo’s smart motion control technology is playing a key role in enabling the unprecedented digital transformation in the smart industrial revolution – IR4.0. 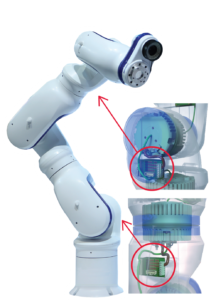 Mounted at the heart of machines, intelligent, compact and decentralized servo drives act as advanced telemetry devices that can sense, monitor, and react accordingly. This smart servo technology not only leads to the very results promoted by Smart Industry, but also helps create leaner machinery that is smarter, smaller, lighter, faster, safer, greener, more efficient and also cost effective. At the core of all dynamic and mobile robotic applications is the ability to move about with motion that is precise, smooth, and above all safe. As more and more small to medium sized companies are entering the realm of robotics, innovative motion implementation tools are expected to simplify set-up, reduce time-to-market, and improve overall performance. The impact of Elmo’s advanced servo technology goes beyond the actualization of motion, with considerable effects on footprint, efficiency, and safety. Elmo’s “Paradox of Smart Manufacturing” article was awarded first place at SPS ipc drives Italia 2018, for: THE MOST PRESTIGIOUS ABSTRACTS under the topic of “The Challenges of Automation: Efficiency and Flexibility”. 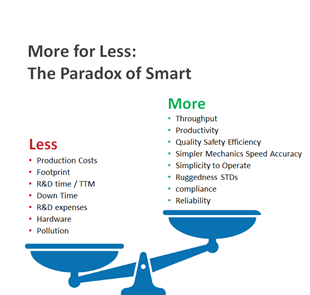 Elmo’s smart drives and control platforms provide a way for companies to improve manufacturing while lowering price, enabling them to deliver more for less. Elmo’s standard, oﬀ-the-shelf motion control products can operate in extreme environmental conditions with temperatures ranging from -104° F to +158° F, altitudes of up to 40,000 feet, and high mechanical shocks or intense vibrations up to 14 g, all products have consistently experienced no failures during the HALT test for accelerated temperatures, electrical cycles, thermal shocks, and vibrations. Elmo Motion Control is headquartered in Israel, employs more than 350 staﬀ worldwide, and has a dedicated presence in the United States, China, Germany, Italy, Korea, Switzerland, Poland and the United Kingdom.